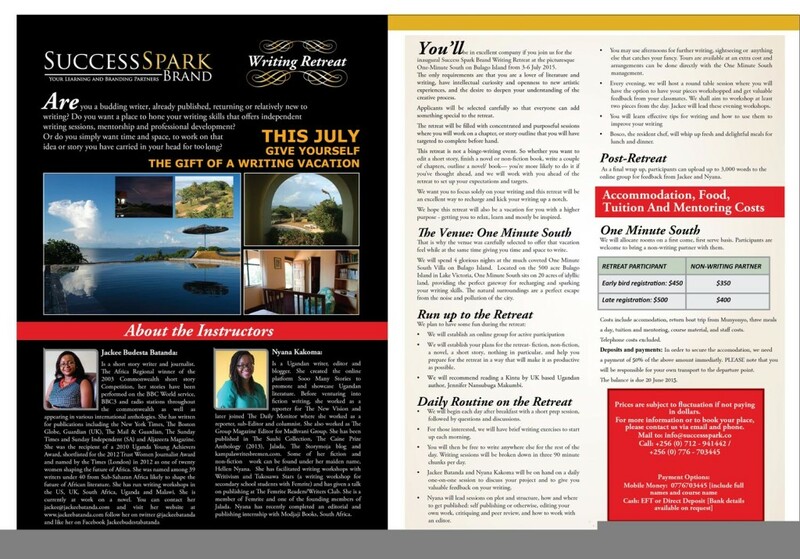 Jackee Batanda and I are excited to bring you this writing retreat at One Minute South on Bulago Island from Friday July 3, 2015 to Monday July 6, 2015. It’s perfect for you if you want to edit a short story, finish a novel or non-fiction book, write a couple of chapters or outline a novel/ book. Jackee and I will be with you daily to discuss your project and to give you feedback on your writing. Applicants will be selected carefully so that everyone can add something special to the retreat. The retreat will be filled with concentrated and purposeful sessions where you will work on a chapter, or story outline that you will have targeted to complete before hand. We want you to focus solely on your writing and this retreat will be an excellent way to recharge and kick your writing up a notch. We will spend four glorious nights at the much coveted One Minute South Villa on Bulago Island. Located on the 500 acre Bulago Island in Lake Victoria, One Minute South sits on 20 acres of idyllic land, providing the perfect gateway for recharging and sparking your writing skills. The natural surroundings are a perfect escape from the noise and pollution of the city. We will establish your plans for the retreat- fiction, non-fiction, a novel, a short story, nothing in particular, and help you prepare for the retreat in a way that will make it as productive as possible. We will recommend reading Kintu, a novel by Ugandan author, Jennifer Nansubuga Makumbi. For those interested, we will have brief writing exercises to start up each morning. You will then be free to write anywhere else for the rest of the day. Writing sessions will be broken down in three 90 minute chunks per day. You may use afternoons for further writing, sightseeing or anything else that catches your fancy.Tours are available at an extra cost and arrangements can be done directly with the One Minute South management. Every evening, we will host a round table session where you will have the option to have your pieces workshopped and get valuable feedback from your classmates. We shall aim to workshop at least two pieces from the day. Jackee will lead these evening workshops. I will lead sessions on plot and structure, editing your own work, critiquing and peer review, how to work with an editor and how and where to get published: self publishing or otherwise. Bosco, the resident chef, will whip up fresh and delightful meals for lunch and dinner. Post-retreat- As a final wrap up, participants can upload up to 3,000 words to the online group for feedback from Jackee and I. Costs include accommodation, return transportation from Munyonyo, three meals a day, tuition and mentoring, course material, and staff costs. Telephone costs excluded. You are, however, responsible for your own transport to the departure point. Deposits and payments: In order to secure the accommodation, we need a payment of 50% of the above amount immediately. The balance is due 20 June 2015. Prices are subject to fluctuation if not paying in dollars. School school School, why do such occasions have to be during the school term???? Missing out. I live in Nigeria, how can I be a part of this?